CCP have just announced DUST514 will be exclusive to the Playstation 3. Which is a shame (check out the EVE Online forums for some stronger opinions). Unfortunately it makes sense for a few reasons (well making it exclusive to one console makes sense – whether the 360 or the PS3 was the better choice is more debatable). Developing for a single console is quicker and easier – especially important for a game that will probably have more updates than the average game. There are suggestions that one or both of Sony and Microsoft aren’t happy about cross-platform multiplayer games. Since the idea of the game (a console FPS interacting with a PC MMO) is quite revolutionary they could get a lot of support (both financially and in terms of marketing and other benefits) from the console manufacturer, but only if it’s exclusive. That being said, it may not be the end for the Xbox 360 and DUST. Sony have suffered recently and definitely have lower consumer confidence (will players have to give Sony any personal information to play DUST?) and this decision will have been made long before Sony’s hacking problems. If sales are lower than CCP hope they may rethink the plan. And remember, “exclusive” in the games industry can be a vague and rarely lasts for ever. CCP recently announced that their long awaited “walking-in-stations” feature will now include an item store selling character customization options exclusively for real money (actually for Aurum another in game currency only available for real money). Some people have lamented the idea of EVE finally entering this area and selling items for real money. After all today you can buy a monocle, tomorrow a ship. This is a slippery slope that will lead to death of EVE Online as we know it. Except, of course, it won’t. Since PLEXs were introduced anything in game has essentially been purchasable for real money. Take the price in ISK, devide that by approximately 350 million and multiply by half the price of a 60 day gamecard. These items are slightly different since they aren’t available in game without using real money at some point (but it is possible to trade them between players so you don’t personally have to spend real money). One final note: the same customization opens are likely to be available to DUST 514 players once it’s released. I’ve had a few things recently I’ve thought of posting but didn’t quite have enough enthusiasm to actually do it. Now I’ve found something I do have enthusiasm about. Minecraft is a clever indie game that has developed something of a cult following of late. It’s an odd sandbox game of building random stuff and surviving attacks by skeletons. Or something. To be honest I’m not really sure (except for the building) since I haven’t actually played it. The reason I bought it (and would like you to buy it) is largely unrelated to the game itself. Apparently a group of self righteous players are unhappy with the progress the game has made recently and have issued an ultimatum that they will launch a DDoS attack at the games servers until there are signs that development is continuing at a speed more to their liking. The assumption is that with the game down the developer will have a lower income and no choice to give in to their demands. There is a small part of me that is worried that this is a clever conspiracy to gain attention and sympathy, but since the game is only 10€ anyway I figured it was worth the risk. 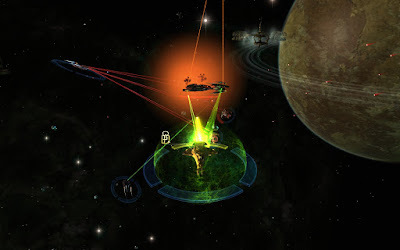 Pendra37 on the STO forums has come up with the first idea to improve sector space in Star Trek Online that actually seems it could be done without majorly overhauling the game engine. The coolness basically boils down to one change: “If you hit the Drop out of warp button, you drop out of warp. A random deep space instance map loads up. The map may be completely random.” For more detail, read the post Sector space makes sense. This reminds me of the fantasy RPG Rings of Power on the Genesis/Megadrive. In that game, for most of the time you controlled and oversized character walking through the landscape. At any time you could press B and the map essentially zoomed in showing you were you “really” were (and that the oversized character was just you represented on a map). Most of the time there was nothing interesting around, but there were things hidden in places that you could find and some quests required you to go to specific places. 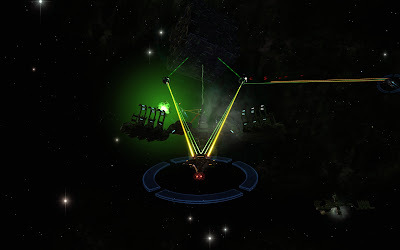 Another pair of interesting ideas for STO I found on the forums. The first is “The Voyage Home“, a framework around exploration type missions based on the story of Voyager. The second is Bridge Officer Story Arcs, missions based around your bridge officers, after you set up some personality options (most importantly, sympathies to certain factions and vendettas against certain factions).